Real-World Evidence for Regime Uncertainty? There certainly are logical reasons to think that Obama’s policies are dampening economic growth. Investors and entrepreneurs have little reason to produce and take risks, after all, when they know the burden of government is going to climb. Especially when you add uncertainty to the mix. 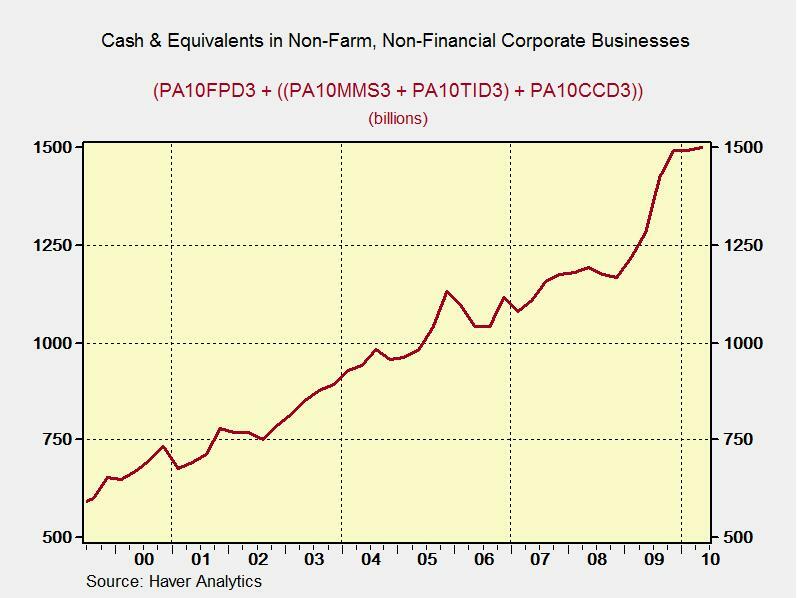 Here’s a chart showing Federal Reserve data on the cash holdings of non-financial corporations. As you can see, there’s been a big jump in recent years. That’s certainly an indication that people are keeping money on the sidelines. On the other hand, there’s been a long-term upward trend in the amount of cash companies are holding, so it’s a good idea to be cautious about drawing any sweeping conclusion from the recent jump. All we can say for sure is that bad policy reduces incentives for productive behavior. This is why bigger burdens of government are associated with slower growth. And if there is a lot of very bad policy, a nation can suffer a lengthy period of stagnation or decline. Roosevelt and Hoover in the 1930s would be a good (or should we say bad?) example of this worst-case result. Dan, wouldn’t an even better / worse example be Cuba, the USSR etal….all now ‘dead in the water’ having “enjoyed” the (rotten) “fruits” of their communist (supremely regulatory) ideology? Accounting question. Is this figure net cash? If companies are issuing debt to build up the cash account on their balance sheets then the net cash position is not actually increasing because it is being matched on the liability side by the obligation.